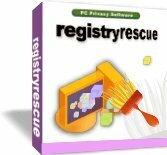 Registry Rescue scan, removes, clean up and repairs invalid entries, references and links in your Windows registry. Errors in your registry, and stuff left behind by other programs in your registry are one of the main causes of system slow down, computer crashes and lockups, also a potential privacy threats. By repairing errors in the registry your system's performance will be visibly increased.